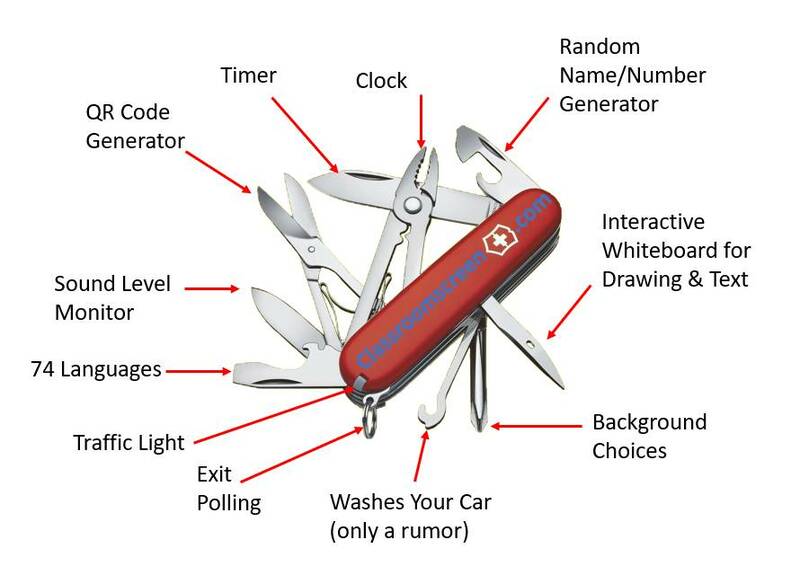 What do the Swiss Army Knife and Classroomscreen.com have in common? Both are easy to use, compact and easily accessible multitools. The Swiss Army Knife has a myriad of tools at your disposal applicable to various situations to make your life easier, and so does Classroomscreen.com. The difference, Classroomscreen.com is a multitool for your classroom designed to make teaching and learning easier for teachers and students. Amongst others, there are 3 things necessary to be a successful classroom teacher: communication, organization, and expectations. This education tool helps teachers bring those 3 things together in one easy and free to use website. Yes, I said free. We like that. Check out the graphic to see a quick overview of what Classroomscreen can do and then watch this video to see how easy it is to use. Click on this link to go to Classroomscreen.com and see how it can help change your classroom.